Product SKU: 127419 ID: avh4201nex. 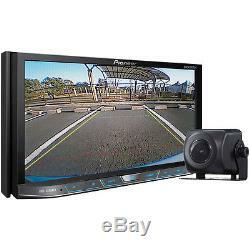 Pioneer AVH-4201NEX with Backup Camera Included. Double-DIN Multimedia DVD Car Stereo with 7 WVGA Touchscreen Display with Android Auto and Apple Carplay and Backup Camera. Pioneer AVH-4201NEX In-Dash Receiver Bundle. WVGA Clear Resistive Touchscreen Display. Includes ND-BC8 Surface Mount Rear-View Camera. CMOS (Complementary Metal Oxide Semiconductor) sensor for improved low-light capabilities and glare reduction. 1/4-inch color CMOS Sensor with approximately 310,000 pixel resolution. 9 lux to 100,000 lux. RMS: 17 watts x 4 channels. Android Auto and Apple Carplay. Pioneer MixTrax Technology creates a non-stop mix of your music library. USB Direct control for iPod and iPhone. Compatible with Apple iPhone 6/6+ and iOS 8 software. SD Card reader for audio and video playback. 3 Sets of 4V preamp outputs (front, rear and subwoofer). AVRCP1.4: Audio/Video Remote Control Profile supports basic remote control functions (play, pause, etc) via Bluetooth. SPP: Serial Port Profile provides a wireless replacement for RS-232 based serial communications. Works with most Bluetooth enabled cell phones. Maximum communication rage: 32.8 feet (approx, line of sight). SiriusXM Satellite Radio Ready: SiriusXM SXV300v1. Steering Wheel Control Ready: PAC ControlPRO. Composite Video Output: Used for connection to separate monitors and other devices. 2 Composite Audio/Video Inputs: Used for connecting video accessories such as game consoles, video cameras, etc. 3 Pairs (Front, Rear, and Subwoofer). Dedicated Subwoofer Preamp RCA Output. Yes DVD DVD+R DVD+RW DVD-R DVD-RW AVI DivX MPEG-4 SVCD (MPEG-2) VCD (MPEG-1). Number of Front USB Inputs. Number of Rear USB Inputs. HDMI 1 Set of Rear RCA A/V Inputs. Yes (Built-In/Included HD Radio Tuner). Apple CarPlay iPhone 5 Compatible iPhone 6 Compatible iPhone 7 Compatible Audio Playback Siri Control Pandora Control. Android Auto Pandora Control Audio Playback. Operate your new radio using your factory steering wheel audio controls with a steering wheel adaptor. Universal steering wheel control interface with automatic programming. PAC ControlPRO SWI-CP5 Steering Wheel Control Interface. Steering Wheel Control Interface for Alpine, JVC, Clarion, Kenwood, Pioneer, Sony, Jensen Radios and More. Use these cables to connect an audio source to your in-dash receiver. AUX-2-RCA: 2 Ft 3.5mm Male Aux to RCA Male Audio Cable. 2 Ft 3.5mm Male Mini-jack Headphone Aux-2-RCA Male Audio Cable Adapter for iPhone 4, Android Phones, iPod, Smartphones, MP3 Players, Tablets, iPad and more. Add an XM or SIRIUS satellite radio tuner to your new stereo with one of the following available accessories. Next Gen Vehicle Tuner for adding SiriusXM Satellite Radio to any SiriusXM-ready car stereo. Get your car stereo receiver installed by an expert, or do it yourself with install tools and accessories found below. Scosche TK12 Car Stereo Installation Kit. Use these accessories to test and tune the sound your new audio system! Monitor the noise level of your new car audio system with this SPL meter measuring from 60-135 dB. Policies for US and Canadian Customers. Return for replacement within: 30 days. Prices, specifications, and images are subject to change without notice. To ensure immediate processing, please be sure to include your vehicle make, model and year during checkout. The item "Pioneer AVH-4201NEX Bluetooth DVD Android Auto/Apple CarPlay HD Radio Car Stereo" is in sale since Wednesday, May 10, 2017. This item is in the category "Consumer Electronics\Vehicle Electronics & GPS\Car Video\Video In-Dash Units w/o GPS". The seller is "www-sonicelectronix-com" and is located in Louisville, Kentucky. This item can be shipped to United States.